IT WAS THE SPRING of 1968, and I was in eighth-grade geology class. I cannot recall the lecture that hour, but I can with no difficulty whatsoever remember the article in a February 1967 back issue of Field & Stream that I retrieved from the school library earlier that day, which featured several tiers around the country and some of their favorite ties. Alongside the photo of Harry and Elsie Darbee were three Catskill dry flies. One of those was the Quill Gordon. After examining the faint image of the fly, I was determined to tie it. 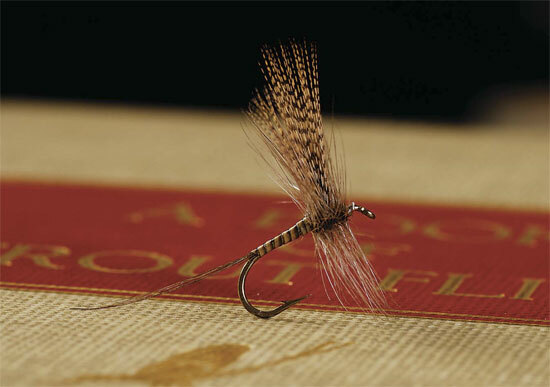 A typical Catskill dry fly tied in the tradition of her parents, Mary Dette Clark’s Quill Gordon (Paul Weamer collection) sports uniformly wrapped stripped peacock eye body, towering wood -duck wings, neatly wound dun hackle, and a space behind the hook eye for a turle knot. Photo by Jay Nichols. The Quill Gordon (or Gordon Quill) was so admired that it even made its way into British fly fishing catalogs, including the Hardy catalog. It is still common in the boxes of Catskill anglers. This one was tied by Mike Valla. Photo by Mike Valla. Quill-bodied dry flies have history that takes us back over a century to the British tiers who recognized the usefulness of the material. 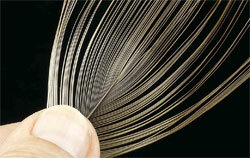 Stripped quill from the eye of a peacock feather was particularly popular. Theodore Gordon, in his letter to G. E. M. Skues in 1911, commented that he was aware that Halford was “strong on quills,” although he had not yet secured a copy of the book to further examine what Halford stated. Halford used birds like condor and adjutant (a rare Indian stork), but others who followed recognized, even in those years, that those materials were difficult to obtain. 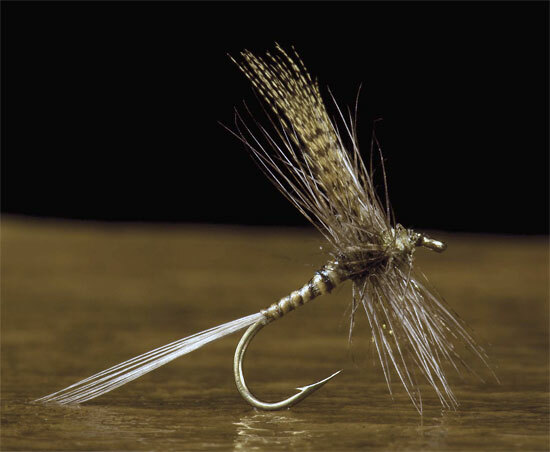 H. G. McClelland, in How to Tie Flies for Trout and Grayling Fishing, recognized the usefulness of quill and said that without doubt the material was the preferred choice for small flies. He spoke of the quill and how it “shows a well defined rib of color, which is a feature of certain natural flies, and an effect not easily rendered in any other manner.” When he described quill, he was referring specifically to the “eye” of the peacock. 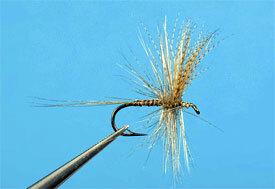 McClelland provides great detail on how to strip the herl from the quill. His instructions are as useful today as they were when he first described them. He recommended using a fingernail or blunt knife to remove the herls from the quill. 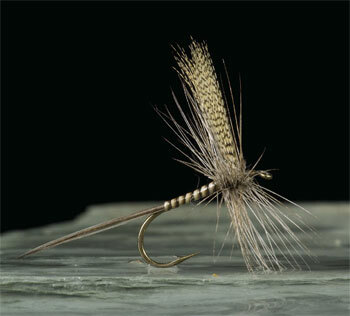 The Cahill Quill, a typical quill-body fly with wood-duck wings, tied by Mike Valla. In this example, the quill was wound up the hook shank with a pronounced taper. 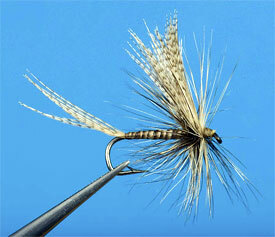 Some tiers, like Art Flick, often tied quill-bodied flies with only a slight taper, if any. Photo by Mike Valla. McClelland also wrote about stripped hackle and saddle hackle for fly bodies; he had learned of the material from a friend, who used a saddle hackle from a dark red gamecock in the tying of a “red spinner.” McClelland wrote convincingly that the stripped hackle quill tapers itself naturally when wound on the hook from the tail to the shoulder area of the fly. A good peacock eye feather. The eye herls, the dark blue area in the picture, as well as the fibers just below it, have the best quills for segmented quill bodies. The small, puny eyes often sold by the small package are worthless. Photo by Mike Valla. Gordon, like McClelland, recognized that although stripped peacock herl made for a natural looking body, it was fragile. He recommended varnishing the foundation for the quill, or even setting aside peacock quill-bodied flies for a couple of months before fishing them. His theory was that the quill would adhere more tenaciously to the hook over time. Beyond those ideas, he recommended winding fine gold wire over the quill in a reverse fashion, and securing it with “two or three close turns at the tail.” Gordon was also particular about the color of peacock from which the quill would be obtained. 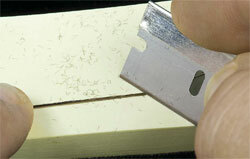 Rube Cross used a common razor blade to strip herls. Cross placed the blade stationary and drew the herl through the edge. I prefer to move the blade very lightly across the herl with light strokes, turning the herl over back and forth in the process. The Dettes used a scissor blade. Some used fingernails. Photo by Mike Valla. He preferred the “blue” old-English variety of bird or the “green” type from China and Spain. Gordon was in search of the lighter quills, and he felt that the Asiatic variety did not provide the shade of quill he desired. Although he had those preferences, he stated that he actually tied his beloved Quill Gordon in three different shades. He sometimes tinged the quill with yellow. Soon thereafter, Louis Rhead, in American Trout-Stream Insects, jumped on the peacock quill bandwagon. Rube Cross also recognized that selecting a proper peacock eye and stripping the herl from the quill could be a troublesome step. Cross recommended selecting peacock eyes based on the shade found on the underside of the eye. He recommended selecting those that had a light shade. This would result in the bicolor light and dark effect that is desirable for the Quill Gordon. Cross stripped his peacock by placing the individual herl on the table. He would then place a razor blade at a 45-degree angle across the herl, then pull the herl through the blade, keeping the blade stationary. Cross recommended wrapping gold wire along the quill to keep it from unraveling. Herm Christian also tied Quill Gordons, and like the others he reinforced the the delicate quill. Flick used household bleach to strip entire eyes within seconds. Full-strength bleach is placed into a small bowl. The eye is submerged into the bleach and gently moved back and forth. 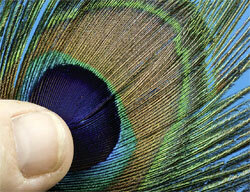 It takes only a minute or two to completely strip the peacock eye. However, if you are not careful and you submerge the eye for too long, the quills become brittle. Photo by Mike Valla. Art Flick argued that using razor blades was too much trouble, and he used common household bleach. Flick placed bleach in a saucer and submerged an entire peacock eye in the solution. After a minute or two, he removed the entire eye and placed it in a solution of baking soda and water, then rinsed with cold water. The bleach does not affect the dark stripe of the stripped herl, and it lightens up the remainder, but it will make the quill too brittle if left in the solution too long. Like Cross and Gordon, Flick also recommended counterwrapping the quill with gold wire, for the same reasons, but emphasized that the wire should follow the quill’s dark stripe. 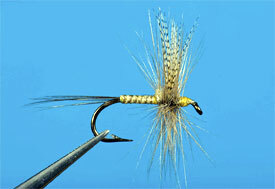 Other tiers had their own ways of reinforcing the fragile quills to keep them from unraveling once a trout’s sharp teeth tore into the fly. The Dettes once counterwrapped the quill with white thread and then varnished the body. Ray Smith used fine, 34-gauge electric motor wire, and Elsie Darbee recommended fine silver wire. Many tiers, however, forgo the wire, instead preferring that the segmentation stand out better and not become obscured by wire or thread. Quill Gordon, tied by Mary Dette Clark. Mary often ends her flies with the traditional turle knot space behind the hook eye. However, in this case her head came right up to the eye. Mary’s view on the space behind the eye is this: “If I end up with the space, great, but I don’t get too worried about having one. Dad was more particular about that.” In the early years, the Dettes counterwrapped the stripped peacock herl with thread. Photo by Mike Valla. Quill Gordon, tied by Theodore Gordon. At the time of its introduction, Gordon typically, but apparently not always, tied the fly with wood-duck flank fiber tails. 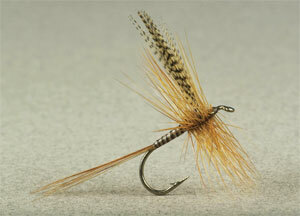 The very early Dette dry-fly catalog listed “tan speckled” tailing. However, as is true with Steenrod’s Hendrickson (which also originally called for wood-duck flank tails) they switched to hackle barbule tailing. Quill Gordon, tied by Art Flick (CFFCM collection), with lighter quill and Flick’s typical wire counterwrap with plenty of lacquer reinforcement. Note the hackle length. The darker quill version is counterwrapped with gold wire. Notice that the quill body is not tapered. Flick also used primrose thread on the head. Quill Gordon, tied by Herm Christian. Notice the reinforcing counterwrapping along the quill body. Quill Gordon, tied by Mahlon Davidson. 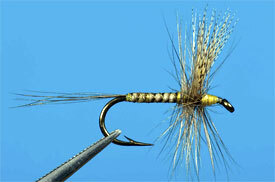 Notice the electrical wire counterwrap, along with the long hackle that was typical of his dry flies. Quill Gordon, tied by Art Flick, with lighter quill and Flick’s typical wire counterwrap with plenty of lacquer reinforcement. Note the hackle length. 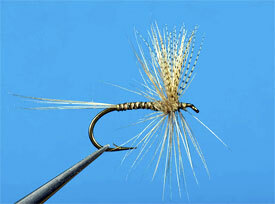 Quill Gordon, tied by Leonard Wright. 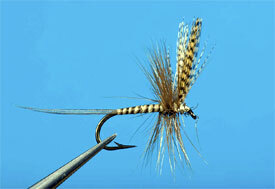 Wright was known for his development of caddis flies, but he also tied many traditional Catskill dry flies.